Marie Reilly was recently interviewed by The Wild Geese about her new album, ‘The Anvil’. Read the interview below or click the link to find out more! During her musical exile, which she says ended in February 2010, she raised her two children, Gearoid Keogh, 25, and Grainne Keogh, 23, a champion step-dancer. Reilly grew up on the family farm, in the townland of Glannagh, Ballinalee, County Longford. She has dedicated her album to her father, famed Longford fiddler Michael Reilly, who happened to be a blacksmith as well as an exceptionally talented and learned fiddler, farmer and father of four. Her father died in 1967 at the age of 46. Five years later, age 18, Reilly left Ireland, living eight years in England, where she taught music and performed with a folk group called Battering Ram. In 1980, she immigrated to the United States. She has resided in Yonkers, N.Y., a suburb of New York City, for the past 28 years. Mindful of the imminence of Fathers Day, we e-mailed Reilly some questions about her father, and his imprint on her life. The Wild Geese: Marie, what inspired you, after decades as a world-class fiddler, to finally undertake the work of producing your debut album? What was the impetus? How long has this project been in the works? Marie Reilly: What was the incentive, you ask? I decided to undertake the work of producing a debut album to preserve the music for posterity. I think it is very important to convey invaluable insight into a unique style of fiddling, the less well-known south County Leitrim repertoire of tunes to a younger audience. Along with the motivation to share such rare music, I thought it would be a shame to give up my special talent. The project started over a year ago when I learned all of the new material, perfected it and started recording last November, (in) 2011. The Wild Geese: Tell us a bit about your childhood — did you take immediately to the fiddle, did your Dad place it in your hands early on, or did you simply find yourself drawn to it? What age were you when you began playing? Reilly: A word to describe my upbringing is that of a humble one, but I can honestly say I had everything I needed. I enjoyed my childhood, growing up on a farm, I never came short of excitement. I loved animals and in particular horses. We had a Connemara pony, named “Molly.” I loved to ride her through the fields and I tried my best to master the art of jumping. More often than not, I found myself on the ground — not everyone can be as successful as [multi-National Hunt champion] Pat Taaffe! Molly was a prize-winning pony, taking first place at many agricultural shows throughout Ireland along with our Irish setter, Florrie. 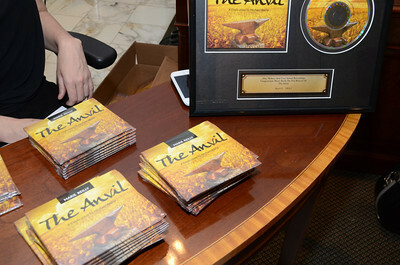 We also had a forge, and I was completely fascinated with it, especially the anvil — hence the CD title. After a day at school, I spent a lot of my time in the forge with my father, lilting, singing, and trying to help him. We both enjoyed each other’s company. The Wild Geese: How many hours a day did it take to gain your level of mastery? Were your brothers and mother supportive, or were there some sibling rivalry, teasing and such as many of us experienced growing up? Reilly: I progressed quickly — with an hour or two of practice every day. Before I knew it, I was playing tunes with my father. My mother, a lovely singer and dancer herself, was very supportive of my music. She would sit, listen, and critique my playing. My older brother, Desmond, was playing music at the same time and we would practice together. This worked well if we were on good terms, otherwise it was a disaster — [then] no progress was made and the practice came to an abrupt end! The Wild Geese: What was your father’s style of both parenting and instructing – very hands-on, demanding or more laid-back, encouraging, nurturing, or none or all of the aforementioned? Tell us about your relationship with your father, both with a fiddle in your hands and without. Reilly: All of the above! He was a very loving man, always encouraging us to reach our full potential. While he was supportive, he could be very demanding at times – at least when it came to music. There was not much play until our school homework was complete, tunes were practiced and up to his standards, which at times were a little high! I had a great relationship with my father. If I am being honest, I was his favorite. (I am sure my siblings would not like to hear that). Wherever he went, I was there, too. Along with taking me to Fleadh Cheoil and Feiseanna, we performed together at local concerts and appeared on national television. The Wild Geese: Your father clearly had an outsized influence on your life, your values. With Fathers Day nigh, If your father were able to read this, to hear this, what would you say to him? Reilly: I love you, Dad, and a huge thank you for steering me in the right direction! I was blessed to have you in my life, not only for the fiddle tradition you instilled in me, but the strength you gave me to pursue my dream. You were and still are my inspiration, and I am sure so many others would say the same. The Wild Geese: And by the way, who has your Dad’s fiddle now? And his anvil? Both would seem like valued, emotional touchstones for you.